Are corporates good as clients? Special guest John Logar definitely thinks so. In this podcast, discover why big companies desperately need the skills of online marketing experts. We reveal some effective processes for tapping into corporate clients. After listening you can become their valued consultant who empowers their marketing strategy and profits along the way. 02:16 – How do we define a corporate client? 06:18 – What’s in it for Internet marketers? 09:09 – Are agencies scared of online marketing experts? 15:15 – Can marketers with limited corporate experience do this? Do it to become it. [Click To Tweet]. Online has huge power. [Click To Tweet]. Turning corporates into cash [Click To Tweet]. James: James Schramko here, welcome back to SuperFastBusiness.com. Today, I’m thrilled to have a preview of one of our SuperFastBusiness Live speakers and experts, John Logar. Welcome to the call. John: Thanks James. It’s great to be here. James: John, where can we find out more about you? John: Probably the easiest way to find me is go to consultingunleashed.com, or you can visit my podcast at businessunleashed.com. James: There you go. That makes sense. So, I’ve invited you to come and talk to our audience at SuperFastBusiness Live number 11 in Manly. You are a repeat visitor. You’ve actually been before. Your presentation was very well received. But most importantly, got lots of feedback about the results that people got when they implemented the things you talked about. I have a suspicion that you’ll be able to repeat this act. John: I mean for me, I think it’s important that if people would tend, one of the things I love about the SuperFastBusiness Live events is that it’s full of great, actionable content and strategies, and for me, it’s really important to make sure that I’m giving something that an audience can actually take away and apply, and see results and get feedback in most cases almost immediately. James: Excellent. And one of the good things about having a little chat before the live event is that our listener can get to know you and whether they attend the event live, and meet you and take in the information directly, or whether they catch up with a recording inside the community, at some point after the event, they’re going to have a lot more context about what you’re talking about and how that impacts them. So we’re going to cut into our topic here, which is around the idea of taking your online skills to corporate clients. I think we should start off by talking about what does that actually mean, John? What qualifies a client as corporate? John: OK. So why do people have this concept of I want to deal with bigger clients? A lot of don’t actually define what that is for them because for some people, a big client could be spending $2,000 or $3,000 a month. Whereas for other people’s interpretation, a big client could be spending $10,000, $20,000 or $50,000 a month. So if you look at what I would deem to be a corporate company, a corporate company would have a fairly large, branded identity. So we’re talking major brands or major companies; if we’re talking insurance, we’re talking companies like AXA or AMP. We’re talking about banking groups. We’re talking companies that are listed on the Australian stock exchange and also large private companies. In Australia, it is deemed that a company that is up to $50 million is classed as a small business. I think most $50 million companies are actually sizeable businesses. But anything $50 million-plus, when you’re starting to the $100 million category, you’re looking at companies that are employing anywhere between 300 to 1,000 people. So corporate companies are very identifiable. They have very big brands. They tend to cater to large mass market audiences, or they are very defined in the types of companies or clients they’re actually dealing. So if you look at mining companies, very specific customers for that market. If you’re looking at banking groups, there are broad range of clients. So corporate to me is any company that is a national, that is highly identifiable and visible and is actually turning over multi-hundreds of millions of dollars. James: So we have a listener based in major western markets like the U.K. and North America. Does this apply to them as well? John: It applies globally. I mean to give you a perspective, I’ve been talking to independent consultants who work with companies like Baulogistik Streif, which is the largest logistics management company in Europe. They are based out of Berlin. So it doesn’t matter where you are, both in the Western or Eastern world, or even developing companies. Large companies need help and support, and ideas and strategies that will help them leverage and grow in their markets. James: Fantastic. So we’ve talked about what a corporate client is. We’ve talked about where they are in the world. What about the idea of taking our online skills to these? Why is this an important combination? Why use your online skills? John: If you look at most corporate companies, especially the way that they market, initially their marketing is revolving around traditional models of mass media penetration. So they use things like TV, radio; they use large sponsorship of global events. So a lot of the communication or the strategy is designed to attract a significantly large audience to connect with the brand or connect with the product or service they have. And most of the actual strategies and the tactics are not actually responsive. What they are designed to do is to create the brand awareness and to communicate a connection with their audience. But in that strategy, it’s surprising a lot of corporate companies don’t actually sit down and say, let’s say for example we’re looking at Mercedes-Benz, at the corporate level, they’re not sitting there saying, “Look. If we get a million people to view our latest product launch, we’ve got a rough idea that we’re going to get a market penetration of about 3% of sales.” And 3% of sales might be 2,000 cars in Australia, or 100,000 cars in the U.S. and 250,000 cars in Europe. They might have broad brush strokes of how they market or how they would display that brand to get that attention, to get those sales. But ultimately, when you look at things from a responsive point of view, very, very few companies, corporates actually think through a strategy where they can leverage themselves online, connect directly to an audience and actually see a direct result to a purchase. And so that’s where online has huge power. Now, some corporates have changed their methodology, and they’re getting really smart, and they’re doing this. But a lot of companies still have traditional methods of marketing, traditional methods of branding and communication, and they’re not asking those — how do we get results? “How do we get effective sales results” questions. What’s in it for Internet marketers? James: So if we’re listening to this, we have some Internet marketing awareness. We might know what a domain name is and a DNS, and maybe we can find someone to build us a website or to create some content for us. We could conduct a campaign of some sorts, and we know what an opt-in is. How could this be useful for us? What’s in it for us? John: For us as consultants? James: Yeah. We talked about why the corporate might be interested in tapping into this new ideas. But why is what we know so valuable? John: What we know is so valuable because we come from the Internet world that’s all about numbers. We measure things, we can see the actions and the behaviors of customers. So providing that type of analytical data to corporates is absolutely huge, it’s a big bonus because they don’t delve. Normally the statistics and the reports they get tend to be general overviews. And most of the reports they get are from broad-based data. So this specific data is not related to specific purchase in a lot of ways. Whereas in our world, we could actually see who opened the email, how many times they’ve opened the email, did they go to the product page, did they press the button to download the incentive to take advantage of the incentive, did they visit the social media page and interact with our promotion. Now, corporates are getting a lot more clever at this, but they’re still doing broad brush stroke. So from our point of view, if for example we have skills, let’s say sales funnel is the buzzword at the moment; everybody’s talking about building sales funnels and automating sales processes. We can actually create test campaigns for corporates for launching products. We can take Jeff Walker’s product launch formula and apply it to a corporate product. Most corporate companies don’t utilize these types of skills. Most agencies don’t even talk to their clients about these types of options. The other beautiful things for us is that the budgets that these companies spend on these broad-based promotions and campaigns is absolutely huge. It is not uncommon, for example, one of the consultants that I work with works with a major corporation in the world, and they want to run a test campaign on a paid traffic ad to generate leads for only one product line. And so they allocated a budget for the test of $120,000. James: Yeah, some big numbers. Having dabbled in this even on a small side of things where I was just really working with one dealer in a large international organization doing a product launch formula, we actually made multiple millions. It actually caught Jeff Walker’s interest in terms of a case study because it was really going into this Neanderthal environments. They are super impressed with even a heatmap. Or this environment, we’re talking about remarketing campaigns and their eyes were spinning like it was the most unbelievable thing ever. Are people scared of Internet marketers? What do you think about agencies who are scared of people like us, who are trying to smother the customer and keep them away from people who know what they’re talking about? John: I’m really glad you asked that question James, because actually, they’re not scared of us. They actually want us to come and talk to them. A couple of the consultants I work with use this strategy to get into corporate clients through agencies. The agency doesn’t provide a direct response service to its corporate clients. It might provide above the line branding and communication strategy, but it hasn’t delved into looking ways of running a specific electronic campaign or a product launch campaign through using online medium. So somebody who has those skills, in fact, one of my consultants picked up multiple 6-figure clients on individual projects purely by going in as the expert on how they launch a particular product using the Jeff Walker product launch formula. So the agency also shared, in that strategic alliance, they have a share, they put their margin on top of the consultant’s margin. So you know, there is huge opportunity within agencies. Agencies are desperately looking for people who’ve got skills. They can add value to their clients. And let me tell you, they’re really approachable, too. James: That’s really good to hear. What other barriers do you think are stopping online marketers from approaching corporates at this point? John: They don’t understand perhaps, probably some of the things that they’re not realizing is how do you interpret or why would a big company deal with an independent person as an expert? So there’s some self-confidence issues that stop people from going there. But at the end of the day, really, if you’re having intelligent conversations and asking questions that are relevant to what people are doing in terms of getting results, then it’s really interesting how quickly, it doesn’t matter who you’re talking to. I mean I remember talking to a Philly senior partner with a major accounting firm here in Australia, and we were just talking about, he was just saying that we do all this tendering for all this accounting audit jobs, and we’re competing with five other guys, and we kind of all look the same. And my question was, what would you do differently? Or how would you set yourself apart from all the other four guys that are crunching numbers like you are that would differentiate you in the way that you present this pitch? And he said, “What I would do is actually start to articulate a more strategic aspect, as opposed to the whole number-crunching aspect.” What does that mean? What does it look like? James: Yeah, it is very good. And the interesting there is if you were a consultant talking to a corporate, then you’re probably not in a tendering scenario with five others. You’re probably the only person who knows this stuff. And the average online business like you or I, we’re doing stuff in our business that corporates won’t be doing for another decade. Like having a behavior or trigger on a video that will send a different email, depending on how much someone watches the video. We’ve been using this technology for years. This is mind-blowing to a corporate. What are some of the other mistakes that people make when they’re thinking about approaching a corporate? John: Location. They feel that if they’re not in the location of the corporate client then it is highly unlikely that they would be even considered for an opportunity. Let me tell you, location has absolutely nothing to do with it. In fact, if we look at one of our friends and one of the people who have been on your podcast and actually presented it at SuperFastBusiness, James Reynolds, the majority of his clients are in the U.S. The majority of his clients, he deals through an agency that introduces him to corporate clients. So location is, for some people I think, well I’ve got to be where my market is. And it’s really interesting. A lot of the consultants that I work with, one, they never meet their clients, the majority of them never actually face-to-face their corporate clients. The second thing is, the majority of their clients are, in most cases, between 200 miles, I’ll talk American, or 400 kilometers to 1,000 kilometers away. Right. So a lot of people think I’ve got to be there, I’ve got to be visible, I’ve got to be seen. It’s all the ducks that I think I need to get in a road to be able to have exposure or to be able to even talk to these guys. These people are human beings just like us. They have massive challenges and massive problems. Larger companies are constantly adding new products, new ideas. Because competition is so strong at their level of the market, they’re always looking at ways of refreshing, reorganizing, innovating on what they do so that they make themselves attractive as possible to their customers and also to their prospective clients. And most of their clients are incumbent to a competitor. So the strategy is if we come up with a new product line, how do we communicate that line to our client base? Again, email marketing opportunities or educational opportunities through using Internet skills. But not only that. How do we educate incumbent clients in markets that may take advantage of new products that we innovate on? So big companies have opportunity for more business or repeat business than smaller businesses have. James: Right. And I remember that even when I was at Mercedes-Benz I was starting to use GoToMeeting instead of flying up from Melbourne to Sydney on a plane. So they were embracing the idea that this remote ability to deal with each other is possible. It’s very pleasing to hear that you can do it. Backing up your point is that James’s clients might be in the U.S. His supplier would be an Australian company who has a Philippines team. It truly is a global marketplace now for people who are ready to deal. You talk quite well John, and you’ve got a pretty good hand on this. Some would say you are very confident and that comes across. But is it possible that someone sitting in the room at SuperFastBusiness Live 11 could listen to your presentation and then actually go and do this? Or is it something that only special people can do? John: Anybody can do this. If I’ve had people who have never been in their own business before, have never consulted before, who just understand a very simple process of opening up dialogue, asking questions, taking a level of understanding, being able to then sit back and look at solutions or options that 9 times out of 10 they don’t even have to come up with to provide a solution. You can use outsourced providers to deliver on a lot of these projects. In fact, most of the people I work with, that’s what they do. They don’t actually facilitate or deliver the implementation. They will go to other sources that provide the level of competency that these clients would require to deliver those outcomes. So the key is that if you can understand a simple, logical step-by-step process, anybody can do this. And the other thing, one of the things that keeps coming across my mind, a lot of people talk about this concept of “Fake it till you make it.” Like I talk well or I do well. Let me tell you, I’m probably one of the most introverted people on the planet. I’m actually quite a shy guy. But when it comes to business, I’ve had to learn to be able to communicate effectively. And the only way that’s happened is that I had to do it to become it. I didn’t fake it till I made it. I actually applied a lot of this stuff. I made all the mistakes. That’s how you learn. That’s how you become stronger and the ability of your confidence of engaging and enabling yourself to be able to work at a different level. So my big belief is to do it, you’ll become it. And each time you put your foot out there, and each time you make another inroad, you can significantly change the way you approach things by having those experiences. James: Well I think there’s some good points in that. Certainly I’ve improved my surfing by doing it everyday. And also, by getting a few lessons when I reached a point where my fitness allowed me to stay out long enough to actually be a good beneficiary of the lesson. So learning from people who understand how to do it can significantly increase your success rate, which is why it’ll be great for you to come along to the event. It’s why we work together in other context as well. So what I would be interested in is, just two parts now I think, you’ve given some examples of the corporate clients. You’ve given some examples of what sort of things might be of interest to them, you’ve also mentioned some of the success stories that people have had. So we’re across all of that stuff. I’d like to get perhaps a tactical and action item that someone could do as a result of listening to this podcast, no matter even if they come to the event or not. What could someone do to recoup their investment of our time together today? You can actually search for the answer to this question, by the way. You can find out what the average sale is for a particular product or service that a company is selling. All you need to do it is Google it. Google is your friend. But you can look at searching sale process. How does a corporate company, like a bank, so half a million dollar banking packages to larger companies? So you can either Google that or you can have a conversation about it and just ask a few questions. Give me some ideas on the trends that are occurring in your industry. What’s the most important thing to you about launching a new product line in your business? You’d be surprised that this people are very accessible even through email. And if you’re going to ask me the question, “How do I find people’s emails?” I’m going to pre-empt that, really simple. You can actually call the company and find out who is the head of that division. Ask to spell their name correctly, and then just check that if their email address would be theirname.whateverthecompanyis.com or their name and the company. So it’s very easy to get their email. And then think about a question that you would like to ask to find out. And in that question, how would you solve the problem? If they articulated or you see a gap, how would you actually go and solve that problem? And then go and have a chat to somebody about the possibility of that being a reality. You’d be surprised at how easy you might find yourself actually consulting to a client. James: John, I think there’s a pretty good chance that if someone’s email is structured in a certain way in a company that most people in that company would have the same structure. James: Well, that was really good. So we’ve listened to this, we’ve had some fun. Is there any reason someone should still come to the event and listen to you speak now or have you given it all up? John: Look, I’m going to give away something that I normally teach my high-end consulting clients. It’s a very specific strategy to get into CEOs of companies, and how to have those CEOs literally walk you through the marketing department and become an arm of their business. So I’m going to share step-by-step the tactic of how you can engage the corporate, a tactic to enable yourself to position yourself as an authority with that corporate very, very quickly, and at the same time, enable them to allow themselves to literally walk you into a sale. So I’m going to show you the actual step-by-step process of how some of the people that I closely work with and how they execute that strategy, and I’m going to literally give you or give the audience that are coming to the event the blueprint, the profile. So literally walk out the door and apply it straight away. James: John, that is fantastic. I really appreciate you coming and sharing this. 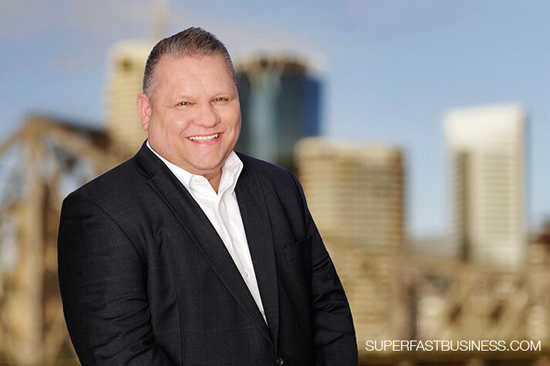 I’m looking forward to your presentation at SuperFastBusiness Live 11. If you’re listening to this and you want to come to the event, please book yourself a ticket. The earlier, the better. John, thank you so much. You have a nice trip. I know you’re heading over to the States soon, where you’re quite in demand as it seems. People want to know about this stuff. So have a safe journey and hopefully, we’ll catch up soon.